...with a local Caribbean Family! Go kayaking. Hike the Jungle. Learn to surf. If you’re ever in Puerto Viejo and looking for a place that feels like family, Come and stay with Veronica and guests. From coconut rice to sweet plantain, come and experience what the Caribbean coast of Costa Rica really tastes like. You want to learn how to cook a healthy Caribbean meal. Your friend wants to learn to surf. And, your new friend is curious about the Waterfall & Chocolate Tour? Do them all! 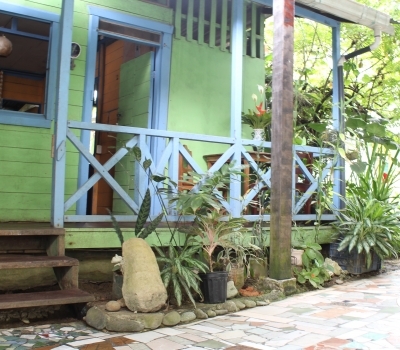 Experience authentic Caribbean living at Veronica’s Place Cabinas. One of the only places in Puerto Viejo where you can live, eat (and cook) with a local family. We offer short and long term accommodations. We have 3 family-size cabinas, and 3 private rooms in our house. The cabinas all have private bathrooms and a shared kitchen, and the rooms in the house are with shared bathroom, kitchen, and living room. 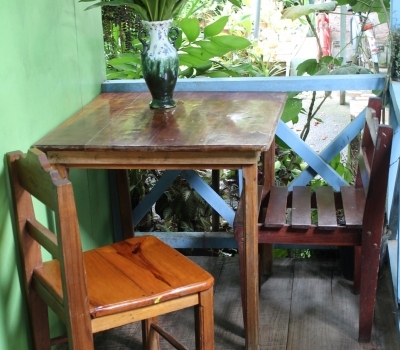 Looking for a cozy place to rest your head while in Puerto Viejo? Come and spend some time at Veronica’s Place Cabinas. Located in the heart of town and less than 5 minutes from the beach, these charming cabinas will immediately let you know you’re on the Caribbean side of Costa Rica. Now, if you want to experience something different, stay a few nights at the farmhouse. Located only a 15 minutes away from the heart of Puerto Viejo, but miles away from the traditional. If you are driven to experience new cultures, positively affect communities, and share in experiences of health and wellness, let Veronica’s Place Homestay be your retreat and your home away from home. the only cabina in Puerto Viejo to consider if you're Veg. Where do I begin, my stay was so fantastic with Veronica that I extended it. She and her family are dedicated to making the world a better place one guest at a time. Once you are there you are treated like family. I absolutely feel I have a home to go back to upon my return to Costa Rica. A fabulous experience for me. Veronica had a great affordable place that was just off the main road. The room was clean and comfortable. I unfortunately spent little time in the cabin. I was busy checking out the surf, the shops and the food. Veronica made a great break fast and I had a few chances to talk to her and her husband about the Afro-carribean as well as healthy vegetarian lifestyle. I could have easily stayed longer. 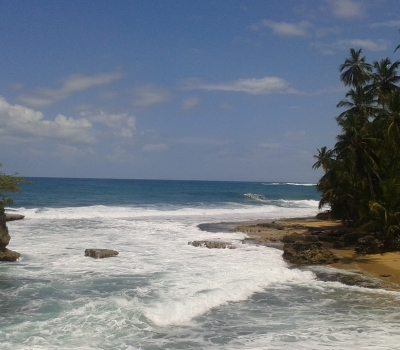 Veronica's place is an island of authenticity in touristy Puerto Viejo. It offers everything you might need, it is close to shops, restaurants, etc. I recommend trying the breakfast, the pudding was just amazing! Get ready for an unforgettable experience! While you walk into the forest, you will gaze and wonder on the exotic vegetation. Most of the trees are covered with mosses, lichens, bromeliads, orchids and other plants that cascade from the branches of these gigantic trees creating a backdrop for life in the jungle. Cahuita National Park, is a protected natural area of unspoiled white beaches and dense jungle that extends to the quaint village of Cahuita. 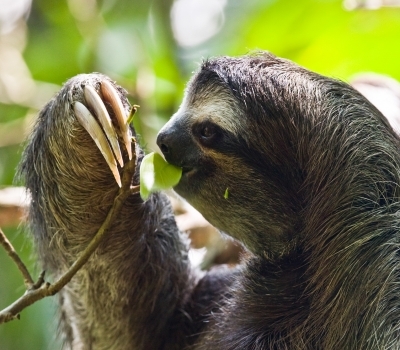 A well maintained jungle path offers an adventurous opportunity to walk amongst the wildlife and possibly spotting a two-toed sloth or a breathtaking blue Morpho butterfly. 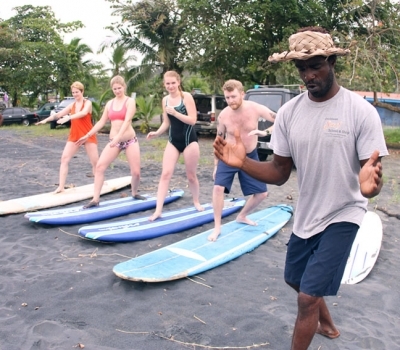 Hershel, our local instructor, has a lifetime of experience surfing the Caribbean and is properly certified in teaching beginners to die-hard enthusiasts. Based on your needs, he will take you to a spot where you will be able to enjoy and feel the passion of running a wave.